The DCCA MBH project will follow policies established for the MBA project. Thus the information given below is drawn from publicly available FCC/SamKnows documentation. How do I become a broadband measurement panelist? SamKnows has built a custom hardware device that simply plugs-in to your existing router. 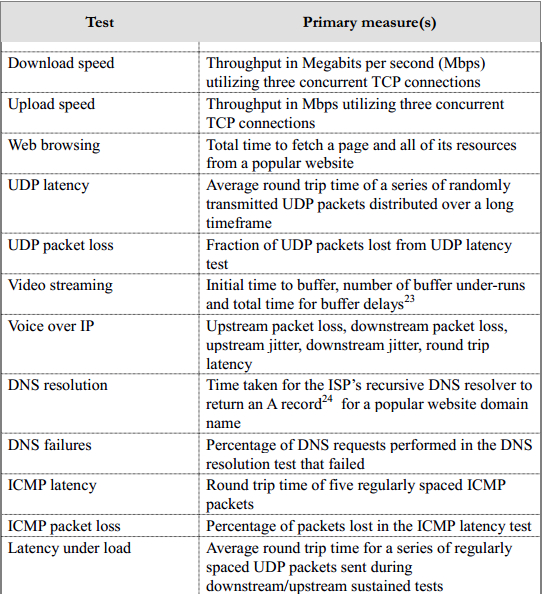 It runs a series of tests that have been developed by SamKnows and approved by governments and academics around the world as being the best method for measuring broadband performance. It does not require a lot of technical expertise to plug-in. It does not collect any data other than about the performance of your broadband. How secure is the device? Does it allow you access to my network? By default the device does not allow any remote access to it. For troubleshooting SamKnows may ask you for permission to access the device via a secure SSH tunnel. This will not give us access to your home computers. How does this project affect my security and privacy? We do not collect any personal browsing data that passes through the device. The Whitebox checks your bandwidth usage to decide whether to postpone the tests – for example, if you’re downloading a large file – in order to prevent any skewed test results. The Whitebox simulates the act of browsing to common websites in order to produce a metric for browsing speed rather than use your own browsing. Testing information uploaded from the unit to our servers contains no information about you whatsoever. Furthermore, all such communications are encrypted, ensuring that results cannot be tampered with en-route. Your individual unit’s test results will be available to you alone. Your unit’s results will also be aggregated with others from the same ISP to form a larger average set of results that can be viewed publicly. What tests does the Whitebox perform? The above tests are performed against a cluster of test servers, hosted all around the US. The web browsing test is performed against 10 real US-based websites. Will this project affect my usage of my Internet connection? No. Our tests are designed to be non-intrusive. The vast majority of the tests that take place throughout the day are very minor and would have no effect on normal Internet activity. Speed tests are obviously more intensive, but before running these our units will check how busy your wired and wireless networks are. If they are transferring more than 64 kbps downstream or 32 kbps upstream then the tests will be deferred for 1 minute and then the process is attempted again and repeated for up to 5 minutes. How much data will be used by the Whitebox broadband measurement process? The usage on a fixed broadband 10 Mbps connection will be around 20GB/month, and will likely be around 60GB on a 50 Mbps connection. The amount that’s downloaded is speed dependent (so a slower connection will use less traffic than a faster connection). How is the Whitebox connected to my network? The Whitebox should be placed in between your existing modem/router and your networked computers. Any devices that connect via Ethernet cable to your existing modem/router should instead connect to the Whitebox. This ensures that the SamKnows device is always aware of the network being used and will never run tests at a time when you require your full bandwidth to be available. Can I use the Whitebox to connect directly to the Internet? No. The SamKnows Whitebox is not a broadband modem or router. It operates as a bridge and connects to your existing modem/router. Does the Whitebox provide a wireless network? No. In the Measuring Broadband America project, the Whitebox does not provide a wireless network, you would use your existing modem/router to continue to provide wireless access in the home. The wireless capabilities of the device are used purely to passively monitor nearby wireless networks for traffic, ensuring that no tests are run when the line is active. What else should I know about the Whitebox? The Whitebox is a TP-Link router running SamKnows custom firmware. It runs as a bridge, meaning that it does not provide any IP addressing and will pass network traffic straight through its ports without causing any conflicts or requiring you to reconfigure your network addressing. SamKnows provides the software. SamKnows, the company contracted by the FCC to manage the project, provides technical support. They are reachable at community@samknows.com. When does the Measuring Broadband Hawaii project end? The Measuring Hawaii Broadband project will likely track the term of the Measuring Broadband America project, which currently has no set end date.